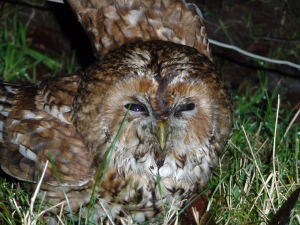 Can anyone identify if this tawny owl is diseased? We heard tawny owls calling all winter as they have done over the last 10 years we have been in the house. However, I came across this owl in mid-afternoon, full daylight. It was in a very torpid state and allowed me to get near enough to touch it. We have not heard the owls calling since. Does anybody know if they are subject to flu like disease and if that is fatal, or is the lack of calling just co-incidence? I know they do have quiet periods.